Even when the gods on Olympus haven’t heard the “Let it snow” refrain there is a good winter festival and activity destination in the Midwest the first week of February. 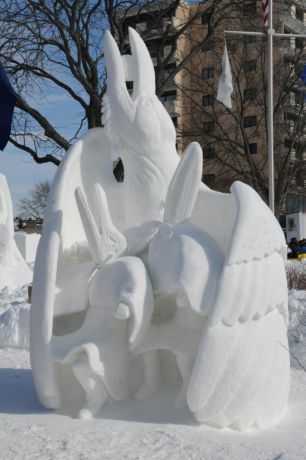 Although Midwesterners typically think of Lake Geneva, Wis. between Milwaukee and Chicago as a summer escape, snow sculpting teams from Alaska to Vermont and several states in between annually head to the vacation town for the US National Snow Sculpting Championship. They know they will have snow to turn into awesome figures and scenes. 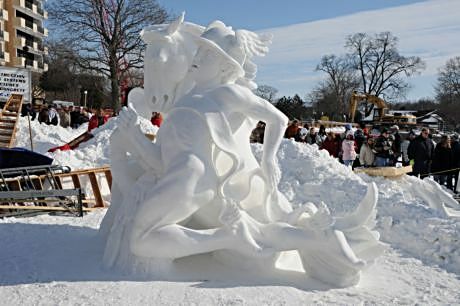 “Competing in the National Championship is an amazing challenge and one of the most unique experiences I’ve ever had as a sculptor,” said championship snow sculptor David Andrews of Madison, Wis. His team took first place in 2011 with “Mercury Racing Pegasus” sculpture. 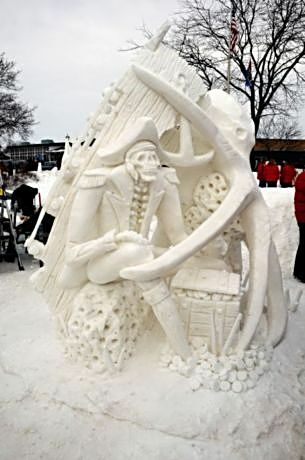 As the winner, his team was invited to compete in the sanctioned International Snow Sculpting Competition. Families descend on Lake Geneva snow sculpting weekend, eager to see the sculptures and also compete in snowboarding and skiing championships and snow activities. They know there will be snow thanks to the Grand Geneva Resort and Spa on the town’s outskirts. A golfing resort in summer and skiing destination in winter, the Grand Geneva makes its own snow. No matter what the weather does, 10 foot high tubes packed with snow made at the Grand Geneva are delivered to Riviera Park downtown Lake Geneva midweek of the national sculpting event. Sculpting teams typically start carving on Thursday and work through the night on Friday so their sculptures look fresh for judging on Saturday. When the weather isn’t doing its part, the resort’s snow machines are also supplying the white stuff for its ski slopes. Shapes emerge from blocks of snow during the week. Sculptures fill the park like an art show on Saturday. Ski and snowboard instruction are offered at the Grand Geneva during the week and demonstrations and competitions are on Saturday before a nighttime torchlight parade and fireworks. Helicopter, wagon rides offered in town and games and music are in the Riviara Ballroom on Saturday. Some downtown shops have candy, wine or party dip samples. Turn the excursion into a weekend getaway so come Friday, check into a Lake Geneva resort, bed and breakfast or hotel, do dinner than walk along the lake front to watch teams put final touches on their artwork. The snow glistening in the park’s lights turn the scene magical. Reserve in advance because people come from all over to see the Sculpting Championship and Winterfest activities.Lake Geneva is about 90 minutes from Chicago and 45 minutes from Milwaukee at US Highway 12 and Wisconsin Highway 50. Saturday morning, stroll past sculptures, ask questions of the artists and vote for your favorite. Take a wagon ride and browse downtown shops and galleries. Return to the lakefront about noon to learn who won. Ahead of time book a dinner reservation at the Grand Geneva to have a parking spot in time for the resort’s Winter Carnival finale of fireworks and its Torch Light Parade from the Mountain Top. A rear-round vacation destination, Lake Geneva has good restaurants, boutiques and places to stay. Grand Geneva’s ski school and slopes is available no matter where you stay. The same is true of its spa facility. The resort is also connected to a large indoor water park. Where to stay and or dine: Abbey Resort, 269 Fontana Blvd., Fontana, 800-709-1323 or 262-275-9000, Geneva Inn, N2009 S. Lake Shore Drive, Lake Geneva, 262-248-5680, Grand Geneva Resort and Spa, 7036 Grand Geneva Way, Lake Geneva, 800-558-3417 or 262-248-8811.